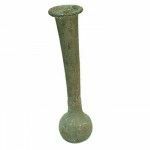 Before the Roman period, glass was very valuable and very scarce. 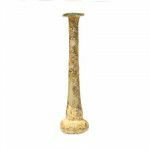 Glass was even more valuable than Gold during the Hellenistic period. These glass vessels were made in a sand core mold and were limited to only very small vessels. Around the beginning of the first century, however, the Romans developed a technique of glass blowing, which allowed the creation of many new designs and shapes, and led to the widespread use of glass in the entire Roman Empire. 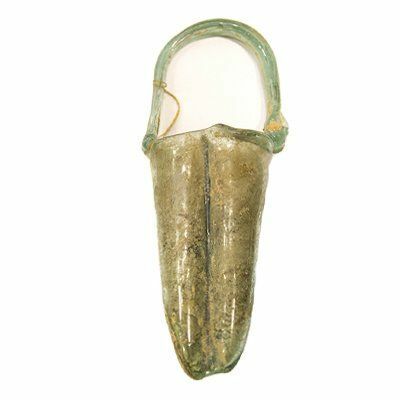 This piece of glass comes from a first century Roman glass vessel which was used in daily life during the time of Jesus. Many of these pieces originate from broken tear bottles which were used to collect the tears of a person to remember times of repentance or morning. This small, broken piece of glass is an authentic part of New Testament history and the traditions of Jesus’ time.